Thanks to the Super Soldier serum, Captain America's strength, speed, agility, endurance and durability have been heightened to the highest levels possible for a normal human. He also possesses an indomitable will, extreme determination, and an inner nobility. Captain America is also a highly skilled military strategist and tactician, and through years of training and practice can hurl his shield with unerring accuracy in such a way that it ricochets back to him. 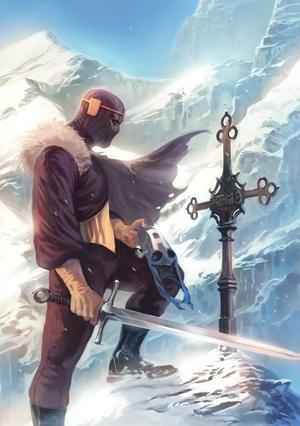 He is arguably the best hand-to-hand combatant in the Marvel Universe. 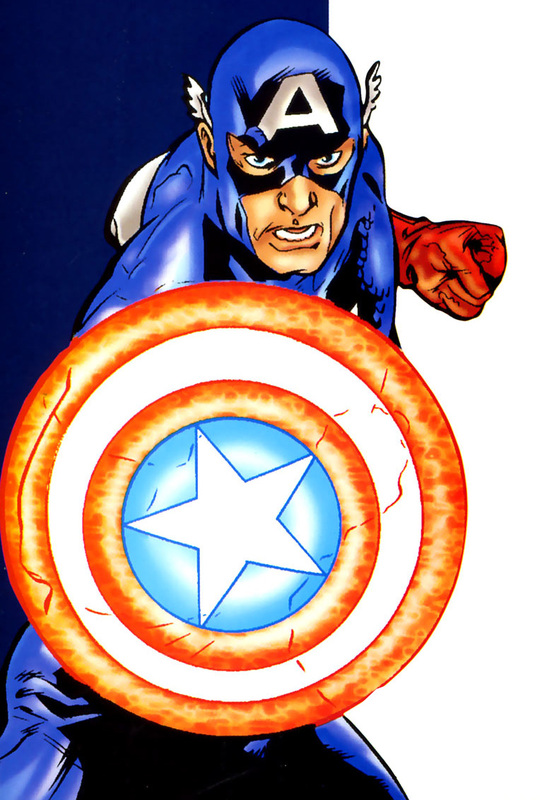 Cap has used other shields on occasion, including his original triangular steel shield, a pure-vibranium version of his regular shield, and a photonic energy shield. His uniform is made of fireproof material and he wears lightweight scale armor. 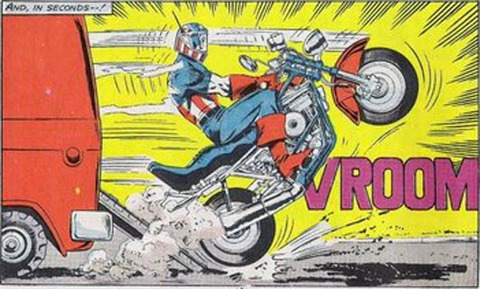 He's also used a S.H.I.E.L.D-modified motorcycle and battle van. Captain America was a headliner in the Marvel Superheroes cartoons of the 60s, featuring a fantastic opening theme song. 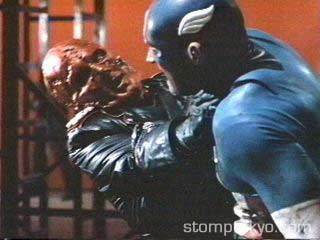 In the early 90s there was a terrible Captain America movie starring J.D. Salinger's son, which featured an Italian Red Skull and rubber ears attached to Cap's cowl. 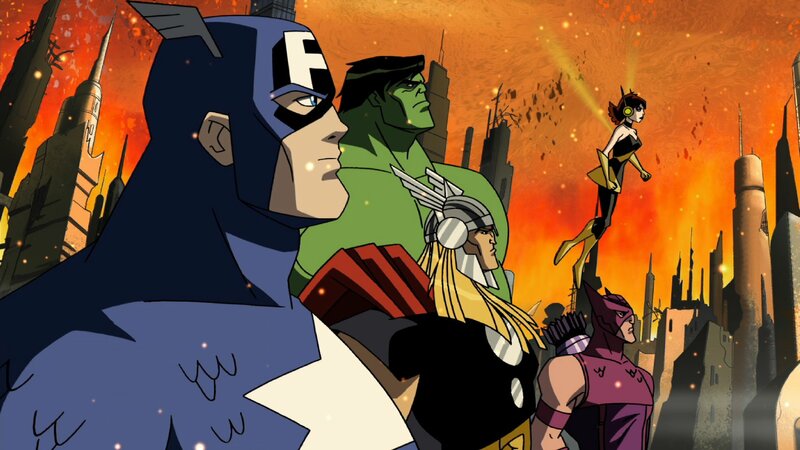 Currently, Captain America is a featured player on the excellent Avengers: Earth's Mightiest Heroes cartoon and is being played by the Human Torch in his feature film debut. 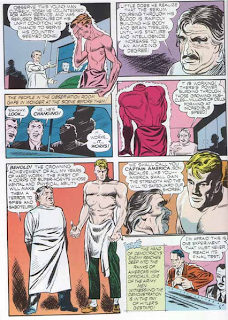 When sickly Steve Rogers is deemed unfit for military service following the outbreak of World War II in Europe, he volunteers for an experimental procedure which grants him enhanced abilities, allowing him to take the fight to the Nazis as Captain America. Avengers #4, March 1964: The newly formed Avengers discover Captain America frozen in a block of ice, locked in suspended animation thanks to the Super Soldier serum, bringing the hero of World War II into Marvel's modern age of heroes. Captain America is the one of the few people deemed worthy enough to lift the hammer of Thor. In many ways, Captain America is a lot like DC's Superman, in that he's a character whom other characters all look up to. Captain America is the gold standard for heroes in the Marvel Universe, respected by everyone from Iron Man to Wolverine to the Punisher. Even some villains and cosmic beings have been shown to respect him. For me, Captain America is a lot like Batman, in that both characters possess an indomitable will. No matter the opponent, no matter the odds, both characters will find a way to win, no matter what. As a result, some of the best Captain America stories are the ones where he faces a seemingly insurmountable situation, simply to see how the relatively down-to-earth Cap will find a way out of it. Captain America is also one of Marvel's oldest characters, his history stretching all the way back to the Golden Age of comics, when Marvel was known as Timely and comics sold in the millions. Created roughly a year before the US entered World War II following the attack on Pearl Harbor, Cap was intended from the beginning to be a symbol of American idealism in the face of European fascism, and famously appeared knocking Hitler cold on the cover of his first appearance. 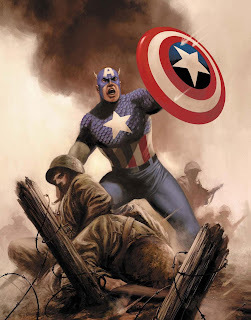 Though America at the time remained divided over further involvement in what was still considered a European war, Captain America was part of a large wave of patriotic heroes that filled the pages of comic books at the time. If America still wasn't sure what she thought about the Nazis, the many European emigrant and Jewish comic book creators at the time made no secret of their position. 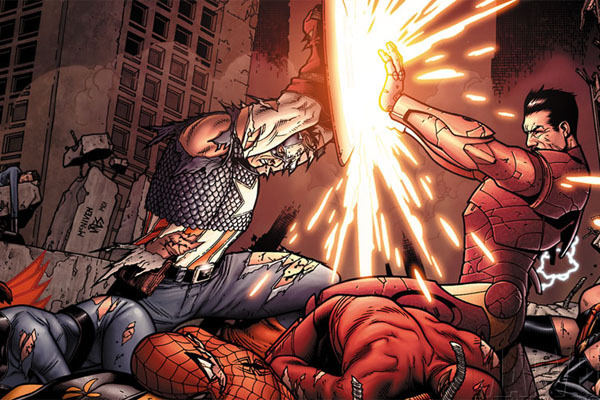 Since then, stories featuring Captain America have often reacted to the political zeitgeist of the times while still managing to depict pulse pounding super hero action. In the wake of Watergate, Steve Rogers was caught up in an adventure which forced him to question his ideals and his role as a symbol of America, leading him to quit being Captain America for a time. He quit again in the 80s, as government bureaucracy threatened to make him beholden to a specific government's policy rather than the greater ideals of the country. 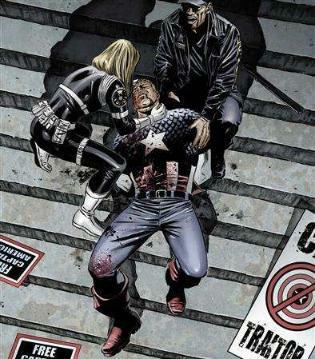 And following 9/11, Cap entered a phase in which he fought for his beliefs and his country harder than ever. 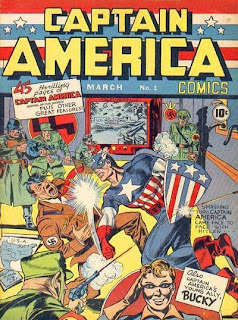 Through seven decades of publication, Captain America has remained a steadfast symbol of the American dream, as well as a Nazi-punching, Fascist-smacking fighting machine. first, that themese song was amazing! they really don't make catchy tv show themese songs like they used to. 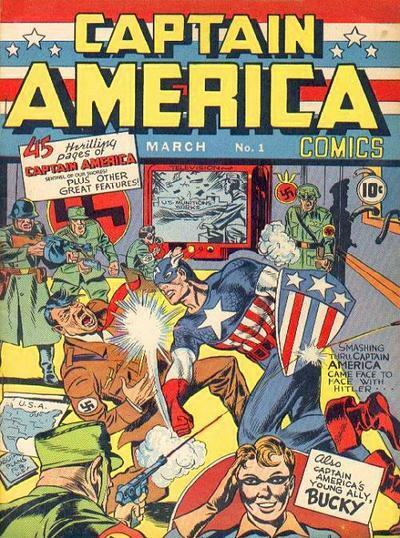 Also i LOLd at that cover where he's punching hitler. Not cuz of that, but because of plucky sidekick bucky in the lower corner, saluting. @Anne: they really don't make catchy tv show themese songs like they used to. Too true. But time is money! Theme song time is time that could be spent on ads! Thanks. I just calls it likes I sees it. Yeah, I've always really liked that little fact. @Sarah: Not cuz of that, but because of plucky sidekick bucky in the lower corner, saluting. "Hey kids! If brightly-garbed supermen aren't enough to lure you in, don't worry: there's an audience-identification character too! After all, even you could be Bucky!" You forgot his biggest weakness of all, 50's pop culture references. 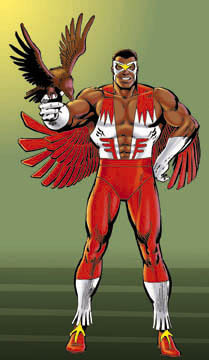 Although, with Marvel's sliding timeline, I suppose now 80's pop culture eludes him? Even 90's? Also, you forgot to mention that, in the new movie, he's being trained by fake-Joker...er...I mean Two Face. @Dr. Bitz: You forgot his biggest weakness of all, 50's pop culture references. Damn! How could I miss that? Yeah, it's a little...unclear exactly how much time he's missed at this point. I do my best to not think about it as much as possible. There was a whole kerfuffle a few years ago over a scene where a reporter accused Cap with being out of touch with today's American because he didn't know what YouTube and Nascar were. The writer of that scene was wildly maligned by most of the comics' internet, with good cause. Or is he Fake Two Face now too, thanks to new Two Face? Old Two Face? In any event, his presence in the Cap movie does seem kinda odd. 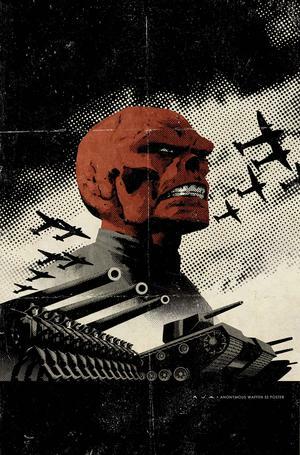 Me too, and generally, I enjoyed it, though I was disappointed that Red Skull killed more Nazis than Captain America. 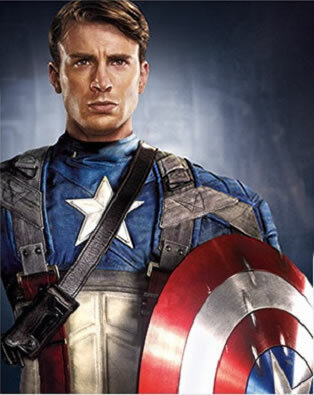 I love Captain America! Due to Comic-Con, I was unable to see the movie over the weekend, but I'm definitely seeing it this week. Good write-up, Teebore! I think you covered everything. And thanks for throwing in that shot from The Infinity Gauntlet, which is the scene that defined Cap for me as a teenager. Not only does he not flinch before Thanos, he even throws a couple punches at him! 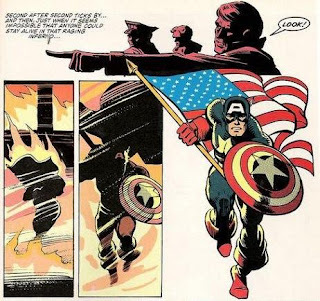 I've seen that image of Cap rescuing the flag from the burning building before, but I have no idea what comic it's from. I should probably find out, though! I notice you referred to Cap's costume as "scaled". Is it officially scale mail now? I mean, that's how it's been drawn for years, but they continued to refer to it as chain mail for a long time even though it had become very obvious on the page that it wasn't anymore. Personally, I've always liked the chain mail look better, and the plain black belt instead of the brown one with all the pouches. 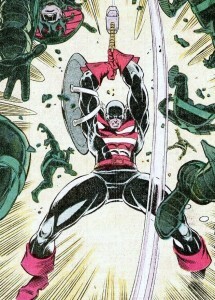 Regarding Cap lifting Thor's hammer, I seem to recall reading a back-up feature in an issue of Thor, maybe during the DeFalco/Frenz era, which said that whenever someone other than Thor or Odin was shown lifting Mjolnir, it was because Odin himself would temporarily lift the restrictive spell in times of great need. Personally, I prefer to think that Cap was just worthy enough to do it. I also like that through the magic of crossovers, Wonder Woman and Superman have both lifted it, too. "why did the word 'theme' in my first comment appear as 'themese'? i mean once i could see being a typo. but both times? somethin ain't right here..."
I just assumed you have an accent. @Matt: I was busy being too nerdy to see a comic book movie! thanks for throwing in that shot from The Infinity Gauntlet, which is the scene that defined Cap for me as a teenager. Me too. And Wizard, for all their faults, really seemed to like it, too. They brought it up a lot, as I recall. Another favorite Cap story along those lines is from the late teens of his post-"Heroes Return" title, just as or after Waid left the book. Cap is fighting Korvac, who keeps recreating reality with himself as the ruler of everything, and in every reality Cap ends up leading a revolt against Korvac, even though every time it ends with Cap getting killed and Korvac restarting reality, and Cap is pretty much like, "I don't care. No matter how futile, I will always stand against people like you." Or something like that. I've seen that image of Cap rescuing the flag from the burning building before, but I have no idea what comic it's from. It's from Marvel Fanfare. Issue #40, I believe, a rare Frank Miller Cap story. Is it officially scale mail now? I mean, that's how it's been drawn for years, but they continued to refer to it as chain mail for a long time even though it had become very obvious on the page that it wasn't anymore. That's how Wikipedia and the Official Handbook refer to it now, so that's what I went with. I seem to recall reading a back-up feature in an issue of Thor, maybe during the DeFalco/Frenz era, which said that whenever someone other than Thor or Odin was shown lifting Mjolnir, it was because Odin himself would temporarily lift the restrictive spell in times of great need. Personally, I prefer to think that Cap was just worthy enough to do it. I think I read somewhere that was something DeFalco introduced as a catchall continuity patch for the times someone other than Thor (and his handful of deemed-worthy compatriots) was shown lifting the hammer. DeFalco definitely strikes me as coming from the Roy Thomas school of continuity, and I could see him wanting to establish that kind of explanation. I'm fairly certain the story where Cap lifts the hammer makes it clear that he is specifically as worthy as Thor. And I love that Superman could lift it in the JLA/Avengers crossover. It's funny because it's canon! I've never thought of it as the most notable accessory in the Marvel Universe, but when you put it like that, you make a good point! And now, the inevitable question must be asked: Lee/Kirby's run, Gruenwald's, Waid's, or Brubaker's? Which is the best?